Dresden. 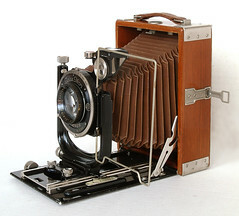 Both were merged into Zeiss Ikon in 1926. Zeiss Ikon is a German company that was formed in 1926 by the merger of four camera makers (Contessa-Nettel, Ernemann, Goerz and Ica), and an infusion of capital by Zeiss. The company formed one part of the Carl Zeiss Foundation, another part being the optical company Carl Zeiss. Logically, most of the Zeiss Ikon cameras were equipped with Carl Zeiss lenses; and the formerly independent companies, in particular Goerz, had to shut down their own lens manufacture. The merged company was also obliged to use Compur shutters for 80% of its cameras. 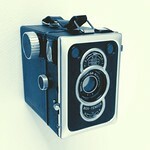 Thus only the simplest cameras could get cheaper shutters like the Klio. 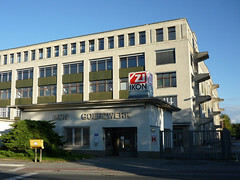 Soon AG Hahn für Optik und Mechanik, Kassel, and Goerz Photochemisches Werk GmbH, Berlin, joined the Zeiss Ikon syndicate. Both companies, Zeiss Ikon and Hahn, were also in the business of producing keys, latches an lock cylinders. This business was more and more concentrated in the former optical factories of Goerz in Berlin. 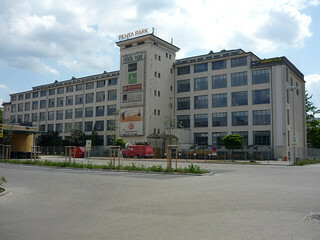 The group became one of the big companies in the photo technology capital Dresden, with plants in Stuttgart and Berlin. 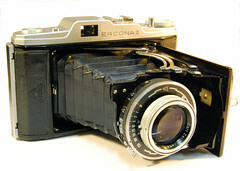 It continued several products of its constituents for a while, but also created new ones like the quality folder Ikonta and the medium format rangefinder camera Super Ikonta. 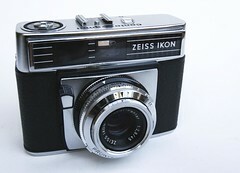 Until WWII Zeiss Ikon was the world's market leading maker of 8mm movie cameras. 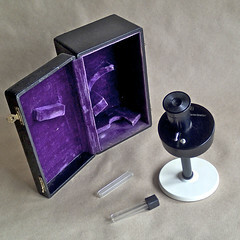 In addition to cameras and lenses, Zeiss Ikon also produced some optics for medical applications. 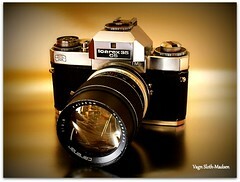 After World War II Zeiss Ikon was split into a West German and an East German part. It was reformed in West Germany, and trademark disputes followed with the part that was left in East Germany. Stuttgart became the company's domicile. 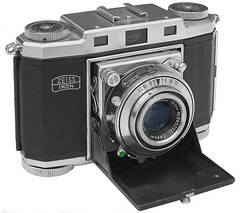 Zeiss Ikon merged in the mid 1960s with Voigtländer, another important German manufacturer, and one that had been controlled by the Zeiss Foundation since 1956. The product lines of Zeiss Ikon Stuttgart were different from the East German company's products. 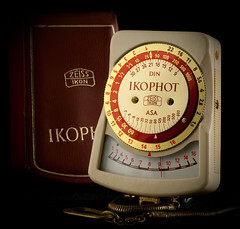 The Ikophot light meters were made in Stuttgart. Zeiss Ikon ceased the production of cameras in 1972. This was a great shock for the entire German camera industry. Parts of the Zeiss Ikon product line then went to Rollei, and part of the know-how was used to revive the Contax name in collaboration with the Japanese maker Yashica. Before reunification the whole Zeiss Ikon keys, latches & locking cylinder business was separated into a separate company. Postwar production, begun early in May 1945, was soon interrupted as several factories were closed for dismantling their production machines. 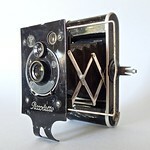 The machines were given as reparation to Soviet camera makers that had suffered demolition during the war. The production of the sophisticated Contax rangefinder cameras was prepared in Dresden and relaunched with new machines in Jena before all the machines were transferred to the Soviet camera maker Kiev. 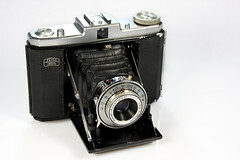 In 1948 the East German part of Zeiss Ikon became state owned. 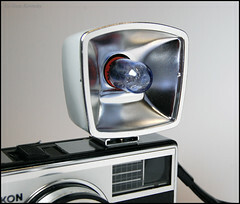 Production and development of Ernemann projectors and movie cameras were continued from 1949. 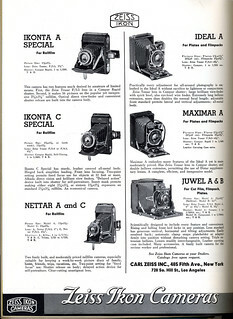 Camera production was continued in 1947 with the Tenax and the Ikonta models. Soon the company's stock of leaf shutters was running out. In 1950 it could produce its own shutters since it took over the shutter production of Balda and the shutter factory of Mimosa. In 1952 the Tempor was Zeiss Ikon's first own leaf shutter development, followed in 1954 by the Prestor, the fastest leaf shutter at this time. In 1948 the company could introduce its advanced SLR model, the Contax S. Since there were suits about trade mark names with the West German Zeiss Ikon AG, VEB Zeiss Ikon was renamed VEB Kinowerke Dresden in 1958. 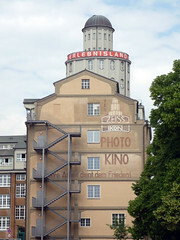 Later it became the main part of the East German combine Pentacon. Today Carl Zeiss is reviving the Zeiss Ikon name. The new Zeiss Ikon camera, introduced at the 2004 Photokina show, is a rangefinder camera with Leica M-mount, developed in Germany and built by Cosina in Japan. 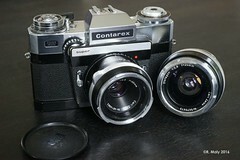 Like the Contax G1 and G2), it has lenses made in both Japan (by Cosina) and Germany. Zeiss Ikon systematically model-coded its produts with cameras, eever-ready cases, flashes etc all bearing their own codes. Barringer, C. and Small, M. Zeiss Compendium East and West. 1940–1972. UK: Hove Books, 2nd edition, 1999. ISBN 1874707243. Tubbs, D. B. Zeiss Ikon Cameras. 1926-39. UK: Hove Books, 1993. 190 pages. ISBN 1874707014. 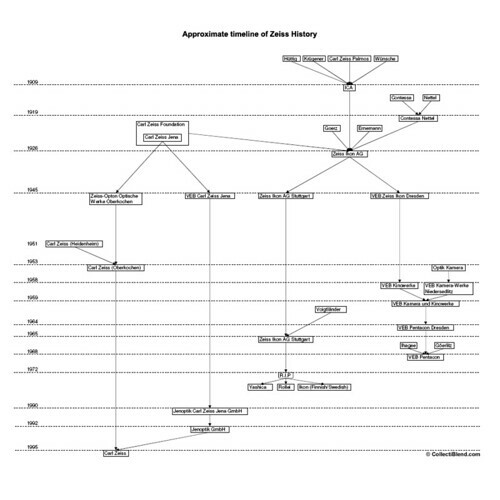 ↑ Reputedly, the word Ikon came from ICA and Contessa-Nettel, two of the constituents in the merger. Other sources claim that it is derived from the Greek, meaning image/picture. ↑ 2.0 2.1 The codes are comprised of a two parts, one before and one after the /. /11 13x18cm (5x7 inch) sheet/plate, for US/UK market? ↑ 9.0 9.1 9.2 Slide Projector manual by Santa via Flickr. This page was last edited on 15 March 2019, at 18:49.